'Rozanne' Exceeds All Expectations | Faddegon's Nursery, Inc. Her real name is Geranium Rozanne® (‘Gerwat) but you can call her Rozanne. Almost every perennial gardener is on a first name basis with her since she makes such a good garden friend. Not every perennial flower garners the praise that she does either. Right from the start in horticultural trials the rumors began that ‘Rozanne’ was going to be something really special. When she first came on the market she hit like a hurricane! People were asking for her before we had even seen or tried her. What makes ‘Rozanne’ so special? Prolific bloomer – So many flowers. We aren’t kidding! 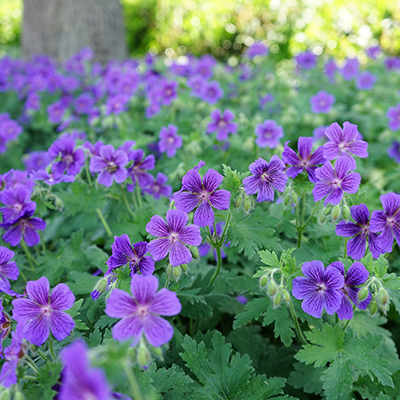 Compact and less leggy than other geraniums – ‘Rozanne’ stands up and stays together. Easy to grow – Ignore her. She’s still your friend. Easy to get along with – If you give her space she’ll spread out and fill it but if you squeeze her in between other plants she’s very polite about her boundaries. Adaptable – Whether in rich or just average soil, ‘Rozanne’ will perform. After she’s established she won’t mind drier conditions. Versatile – She can do anything. Use her in mass plantings, as a focal flower, in a container or a hanging basket. A perennial flower that can serve in place of an annual! Exceptionally long bloom period – Is Spring to frost long enough? Shear back in August for a strong flush of new flowers. Tolerant of any climate – Cloudy and dreary? Cool? Hot and dry? She won’t care. Tolerant of full or part sun – Full sun, that’s fine. Don’t have a full sun spot? That’s fine too. The only thing she could do better is bloom all winter!